You would not think that by the fifth book of a ten book series, it would be prudent to be introducing what is essentially a completely new cast of characters in a completely new situation. And sometimes you’d be right. To my surprise, though, not always. 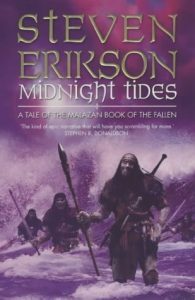 Midnight Tides marks another high water mark in Stephen Erikson’s epic tragedy of the Malazan Book of the Fallen. It has a lot of oddities relative to the rest of the series. It’s almost completely prequel, in that it tells the story of a character first met in the fourth book and how he came to the dire straits the reader first found him in. (Or it pretends to do that, though ultimately it stops short, leaving us with only the flavor of that betrayal. Which is okay.) It essentially leaves out the Malazan Empire entirely. And there’s considerably less warfare than I personally am used to from the series. Nevertheless, it has a lot of what I’ve come to look for, too. For one thing, the Crippled God is here in force, revealing enough of his nature that it’s finally fair to pick a side. But mostly I’m not talking about plot elements, because these aren’t books you come to for the plot, good though it is. It would be like admiring Monet’s work with stippling and never bothering to step back to see the actual image on the canvas. We have tragedies galore; mirrored families on both sides of the conflict, one betrayed by the empire they are sworn to uphold, one doomed by attempts to tear down the evils they see in an empire that has long since outlived whatever good it may once have brought to the world. And within the families themselves are betrayals and true brotherly spirit alike, sometimes from the same brother to the same brother, in the same action. It’s a complex tapestry against which to weave the fall of an old, old empire to the ascendancy of a bloody new one that has forgotten its own ancient past, wrought in bloodier betrayals still. This is also the funniest of the books so far, perhaps in an attempt by the author to cut the horror and tragedy to bearable scales? It worked, in any case. It’s been a while since I’ve laughed so often at a book that wasn’t written to make me laugh. Best of all, there are a few people left to play meaningful roles in the future of the tale; I’m pleased, because these are all people I really want to see more of. One off note, which I suppose is inevitable these days. Was I the only one who saw the Letherii Empire as a blatant caricature of a popular external view of modern America? It’s not that the overt politicizing of a really good story would bother me (although it does, a bit), so much as that on more than one occasion it forcibly pulled me out of that story. That, I really don’t care for. This entry was posted in Words and tagged epic fantasy, The Malazan Book of the Fallen on December 21, 2005 by Chris.